The Hye Zoravar, the loyal cadre of Aznvakan Aspet who exclusively serve the Royal Princes and the Hai Arkah (Armenian King), are among the fiercest warriors known to Hayasdan; unbowing in the face of certain death, unquestioningly loyal to their King. Fully clad in the most well crafted of armours, these men are a fearsome sight on the battlefield, bolstering allies and weakening the resolve of their enemies. Their armour consists of a conical helm, in the Assyrian-style, with an aventail guard to protect the neck; an iron scale corset covered with a decorative leather tabard; and banded arm and leg guards to protect the limbs from harm. The Hye Sparapet, armed with a two-handed lance, can be the decisive force on a battlefield, routing enemies with a single charge. If, however, they get bogged down in combat their maces will crush the enemy beneath them, crumpling all but the hardiest of armours and stoutest of shields. For greatest effect the Hye Zoravar should be used at the defining moment of a battle when all other forces are committed to the fray, charging into the flanks or rear of an enemy in an effort to break them. 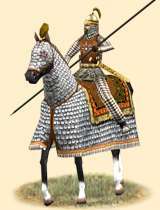 Historically, the Armenian lords assembled a strike force of heavily armoured men to comprise their personal guard. Those warriors were fiercely loyal and courageous. However, their limited numbers (they were very expensive to equip) severely constrained their tactical impact.